2 Tablespoons Sriracha "Rooster Sauce"
Blend together the Sriracha, oil, lime juice, cilantro, and salt. 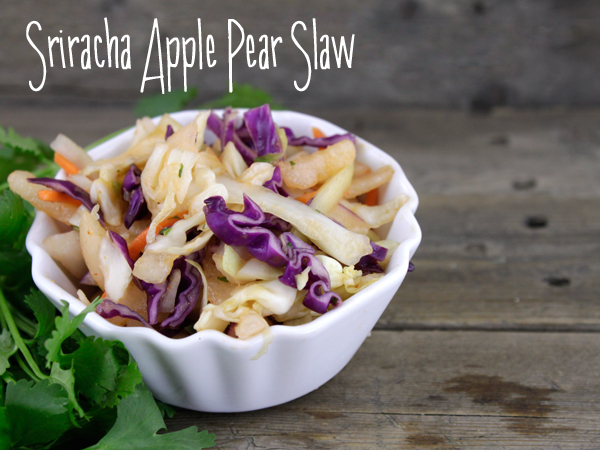 Set aside in the fridge while you prepare the rest of the slaw. Thinly slice the cabbage and place in a large mixing bowl. Add the 1/2 cup shredded carrot. Peel and seed the cucumber. Cut the flesh into matchsticks, about 2 inches long. Add to the bowl. Remove the seeds from the jalapeno, then mince and add to the bowl. Peel 2 Apple Pears, core them, and cut the flesh into matchsticks, about the same size as the cucumbers. Add to bowl. Pour the dressing over the whole thing and toss to coat.